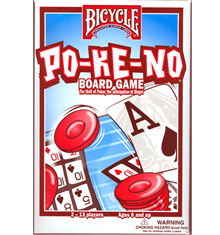 Enjoy the thrill of Poker and the suspense of Keno with these Bicycle Brand POKENO Sets. "The Original" POKENO Set features 12 jumbo index POKENO Game Boards and 200 chips. 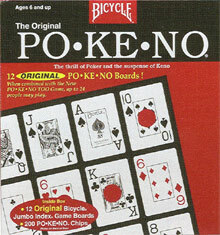 "The New Edition" POKENO Set features the original POKENO Game with a new look. Original Set Sale: $9.76. Was $18.95. Save 49%! New Edition Set Sale: $8.26. Was $18.95. Save 56%! For additional information on our Gaming Supplies, please contact us at 1-800-233-0828. Or, get a copy of our FREE 104 Page Casino / Game Room Supplies Catalog.